I have a problem with finding a shampoo and conditioner that actually makes my hair feel clean. I know, this sounds so strange but this is what has been happening to me. It doesn’t matter that I do a double cleanse, my hair still feels dirty. I am in a constant search for a shampoo and conditioner that works for me and my hair type. I don’t have the easiest hair to find products for. I have thick color treated hair, and right now it’s the longest it’s ever been. 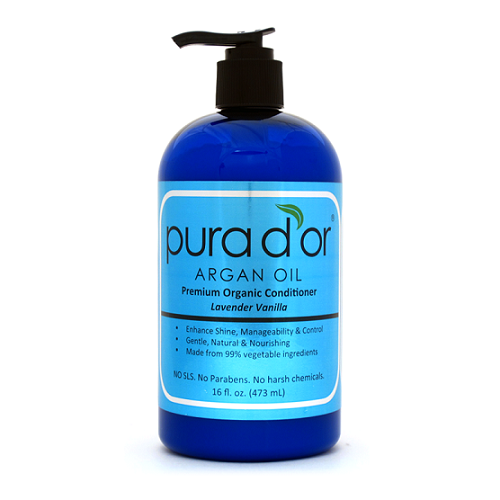 I have been using Pura d’or Argan Oil premium organic shampoo with hair loss prevention therapy and their premium organic conditioner infused with lavender vanilla. I didn’t have high hopes for this product because 1. I had never heard of this line before and 2. I am always disappointed no matter how expensive the product. The key points that really intrigued me to try out this product were that there are no Parabens, no SLS, gluten and safe for color treated hair. It has twelve advance DHT blockers to stop premature hair loss, vitamins for hair growth and is all natural and organic. On the label it also says for excessive shedding. I feel like I have been shedding tons of hair for years. I have never seen a product that addresses this issue. I wasn’t looking for a shampoo for hair loss but it doesn’t hurt with my stress level to have the added benefits of hair loss prevention ingredients in my shampoo. My first impression of the shampoo was that it smelled like a spa. It reminded me of when I was at The Four Seasons spa in Las Vegas last November. I liked that the consistency of the product is creamy, not too thick and not too thin. I do get a little lather when I shampoo my hair and it actually feels like my hair is clean and not striped. 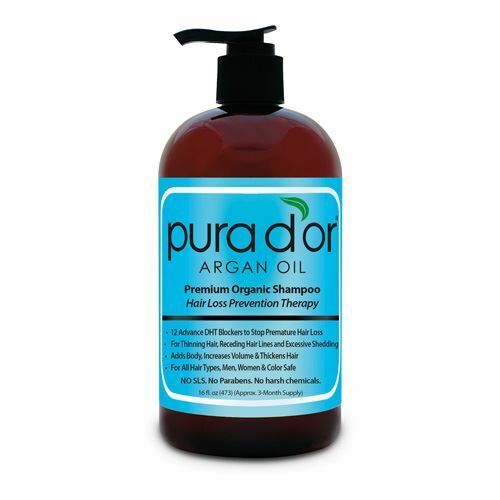 I noticed that my hair was bouncy and shiny after my first wash. Pura d’or shampoo comes in a 16 fl oz pump bottle, which is approximately a three month supply and retails for $28.00. I was thrilled that my hair after shampooing felt clean, now the challenge was to use the conditioner. I was hoping that it was not going to weigh down my hair or add build up. The conditioner also contains no Parabens, Sulfate or Gluten. It is Argan oil based, it’s free from artificial fragrances, artificial colors, DEA, SLS and made from 99% vegetable base ingredients. On the label it says “Lavender Vanilla” but to me it smells like delicious coconuts. It does contain coconut and vegetable proteins to help hydrate so I am thinking that is why I am picking up on the coconut smell. The conditioner also comes in a 16 fl oz pump bottle and retails for $28.00. I look forward to washing my hair now knowing that it looks healthy and vibrant. I am not adding tons of toxins to my head every other day. Overall, I feel that this product is a great value. You get three months out of each 16 fl oz bottle (a little over $9 a month). I would gladly pay more for a product that leaves out all the harmful chemicals that you see in most shampoos and conditioners. Check Pura d’or on Instagram to see their latest product launches.